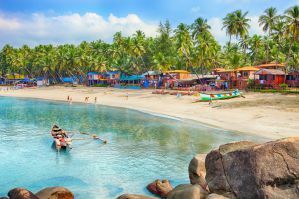 Goa is a small state on India's west coast. It has been divided into just two districts - North Goa and South Goa. Both North and South Goa are similar and each has both coastal and interior areas. The state was once a Portuguese colony and today it has a unique mix of the Indian and Portuguese cultures and architecture. It's one of the more popular tourist destinations in the country and it attracts about 2.5 million visitors every year. About 400,000 of those visitors are international. Goa is reasonably priced and there are many budget accommodation options around. The peak season is between November and late March and prices can climb higher during these times. If you're going to be in the area between Christmas and New Years, make reservations very early as everything fills up quickly. How much do hostels in Goa cost? A good hostel for solo travellers, female travellers, couples, and small groups. The Hostel Crowd is a chain of backpacker hostels found in several cities in India. The hostels are run by a group of young travelers who wanted to ditch a more conventional life to live a life more in tune with their values. The hostels focus on bringing together international travelers while giving back to the local community. They hire local residents to staff the hostels and try to make sustainable decisions with development. Jungle Hostel is located in a traditional Portuguese house that has been redesigned to function as a hostel. There's a fully equipped kitchen which guests can use, 24/7 security, many outdoor terraces, a large garden, and a nice common area. This is a great hostel where you can relax and meet other guests. There are also the standard amenities available including free wi-fi and complimentary breakfast. The hostel is surrounded by jungle and has a lot of character. It's a nice setting if you want to explore the area, enjoy morning yoga, or simply soak up the Goan lifestyle. Both private rooms and dorms are available. Private rooms include singles, twins, and doubles. Dorms sleep four, six, seven, or eight people. Both co-ed and female only rooms are available. Summer Hostel is another hostel owned by The Hostel Crowd. It's a good place to stay if you're visiting Goa specifically to hang out on the beaches in South Goa. It's walking distance to the water and it's easy to head out and relax in the sun in typical holiday fashion. There are also shuttle buses that connect this hostel with the other Hostel Crowd hostels in North Goa. The shuttle runs on Tuesdays and Fridays. This hostel has both private rooms and dorms available. Private rooms include singles, twins, and doubles. Dorms sleep four, six, or eight people and both co-ed and female only rooms are available. All rooms have their own attached bathroom which is kept clean and modern. Other amenities available through the hostel include free wi-fi and free breakfast. A popular party hostel that is a good option for solo travellers and small groups. Prison Hostel is also a hostel run by The Hostel Crowd. It's a self proclaimed party hostel and is in walking distance to the anjuna flea market as well as the craziest parties in India. If you've come to Goa for the party scene, then this is the place to stay. There's an endless supply of beer and a fun crowd that's always looking to have a good time. The hostel has a decent common room which has it's own music system. There's also free wi-fi, a decent breakfast, and scooter rental available. If you've come to Goa to meet other young backpackers who want to party hard, then this is the place to stay. There are private twin and double rooms available as well as four, five, eight, and ten bed dorms. Some of the four bed rooms are female only. A good hostel for solo travellers and small or large groups. Zostel Goa is another popular hostel in Goa. The hostel has a nice common room where many guests enjoy hanging out, swapping travel stories, and playing games. The hostel is relatively large and can handle both large and small groups. It has a social setting so whether you're traveling alone, with a significant other, or with a group of friends, you'll likely feel comfortable staying here. It's easy to meet the other guests and the atmosphere is welcoming and friendly. The staff is also helpful and knowledgeable. They can answer any questions about restaurants, entertainment or transportation. If you're looking for an affordable and fun place to stay then this is a good option. Both private rooms and dorms are available. Private rooms sleep up to three people and dorms sleep six, eight, or twelve people. Both female only and co-ed rooms are available. Check out other places to stay in amazing destinations around the world.